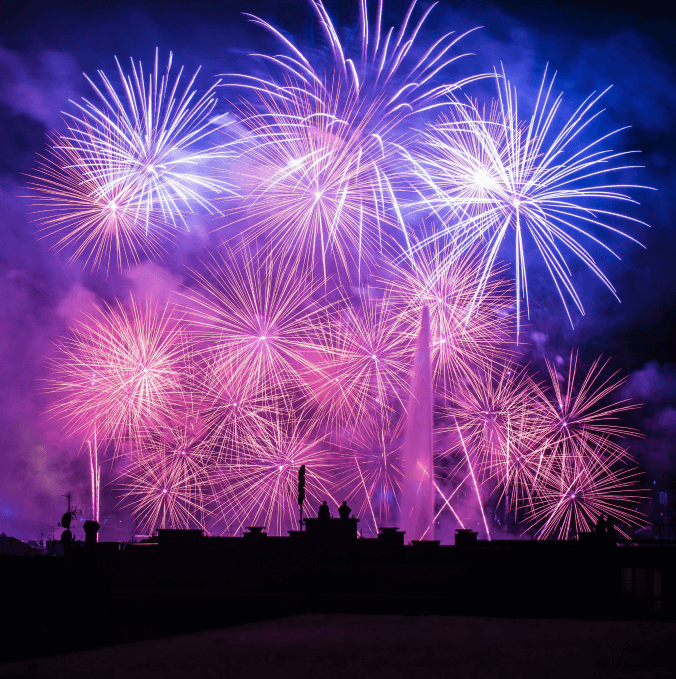 Design your next webinar invitation email and go Pro! How many webinar invitation emails do you find in your inbox? You’ve probably seen dozens, if not hundreds, of webinar invitations over the course of your working life. 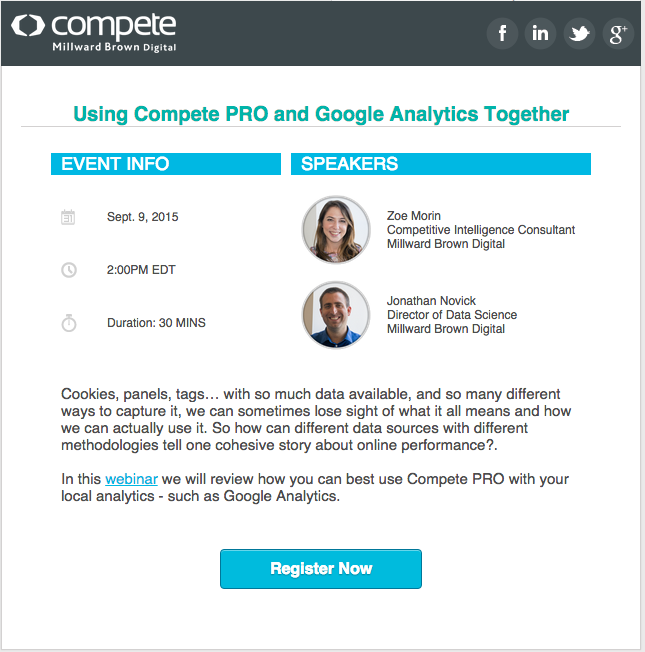 And you’ve probably seen what has become the de facto webinar invitation email—a two-column email with the date and time of the event, a short description of why you might want to attend, and photo of the presenter, similar to this one from Compete, a software analytics company. The fact is, most webinar invitation emails don’t have a lot of personality. They give potential attendees the basic information they need — event time, duration, speakers, and a Registration call-to-action button, but they don’t make you feel anything about the brand. They are all business—they’re starkly minimalist, and they all seem to use that same light blue for the highlight color and call-to-action buttons, no matter the brand. Skillcrush is a coding academy that focuses on teaching women how to code, and how to change their careers once they have the technical know-how. 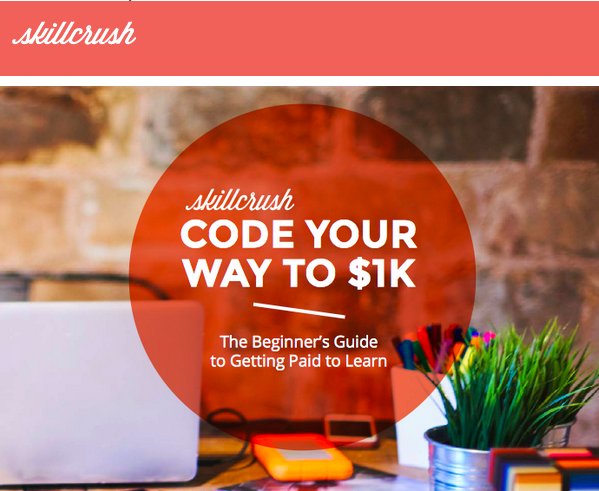 With the goal of helping women advance in a career typically dominated by men, Skillcrush has succeeded in reaching thousands of women and helping them learn to code on their own time (Skillcrush classes are entirely online) and then use their newfound skills to enter and master a new career. 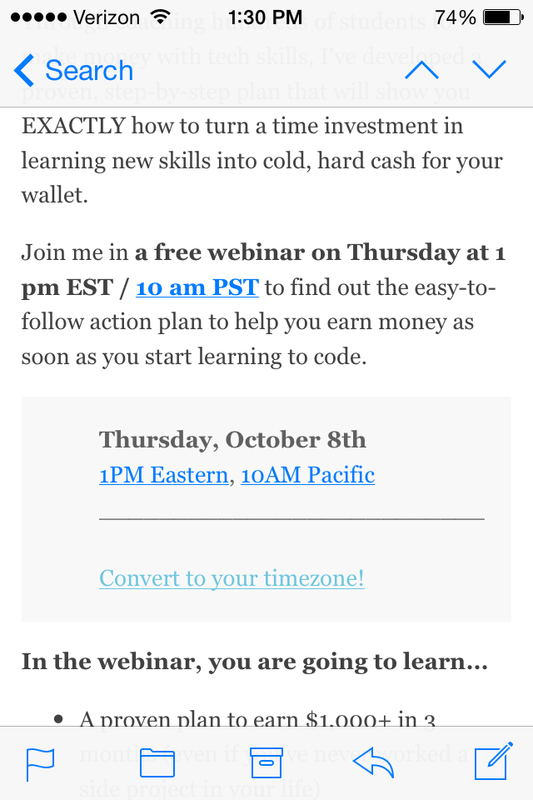 Just like Skillcrush turned the coding world on its head when it focused on appealing to women, it does the same with its webinar invitation email. Many businesses like Skillcrush use webinars as a way to generate new leads for classes or business, or to deepen a relationship with existing, or prior, customers. Email invitations to webinars are crucial for getting potential customers to attend your event. Marketers report that as many as 64% of webinar attendees arrive there through email invitations. So if you want people to show up at your webinar, the right email is essential for getting them there. A webinar isn’t something customers attend on a whim; it’s a time investment and your email must make it clear that your event is worth their while. Skillcrush makes this clear with its use of a strong message and on-brand imagery right at the top of the email. You’ll notice there’s a stark difference between the headers of the two webinar invitations above. Where Compete states its purpose with a single, simple line of text, Skillcrush uses a beautiful image as its background, with a strong color overlay with text on top. The image it chooses is one its audience can easily relate to — the desks of many of its customers may look exactly like this —with a laptop, several devices, and a plant. The color palette of the image is soft, but the reddish-orange transparent color used behind the text is a strong color that frames the message. With its image choice, Skillcrush feminizes its invitation, which is crucial for its audience, but it also lets its customers know it means business. The reddish-orange is a color that evokes strength and vitality, and through that choice of color, Skillcrush is conveying its webinar will make your career stronger and more vital. 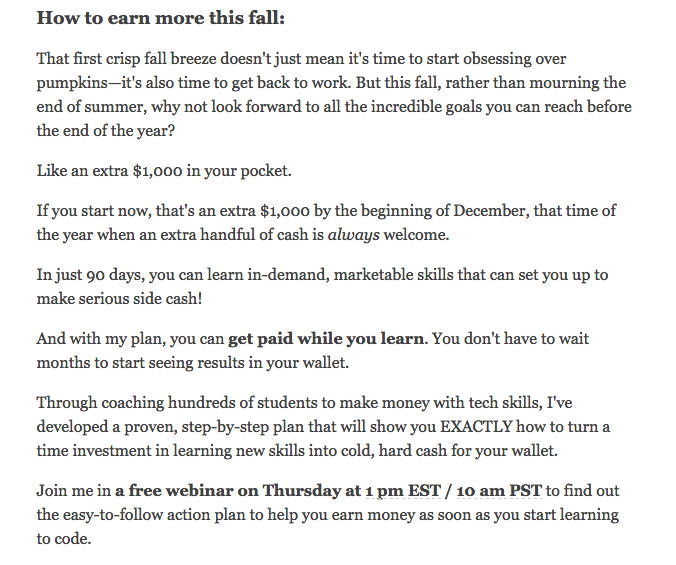 The main message is “Code Your Way to $1K.” Women receiving this image know immediately that this webinar is about making money and enhancing their career, but it’s also geared toward them as women. This is a real diversion from the simple line of text header that many webinar invitations employ. Those are simple, but they don’t speak to a particular audience. Skillcrush knows exactly who it wants to talk to. 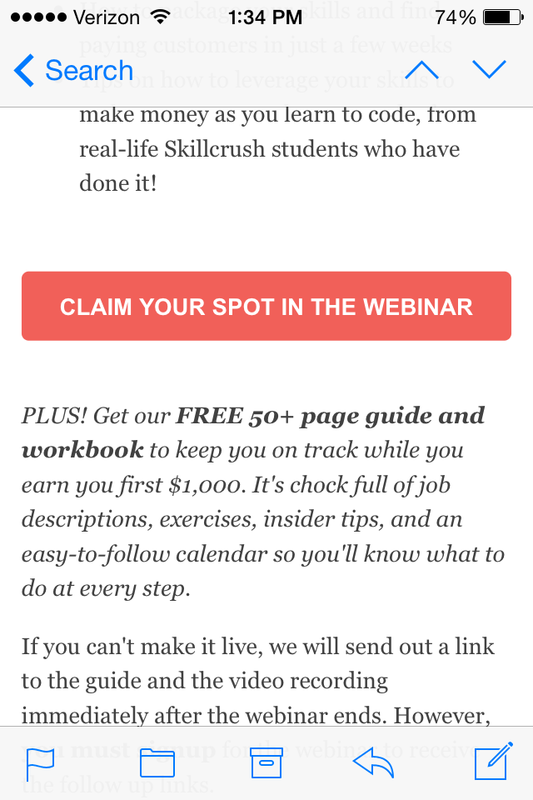 You’ll notice that the text doesn’t actually say “webinar” anywhere — but readers already know this is a webinar invitation because the first words of the subject line were “FREE WEBINAR.” Instead of repeating that, Skillcrush instead uses the small amount of space it has to get you hooked to tell you what the webinar is actually going to be about. Again, Skillcrush knows its audience. The company offers plenty of details on the webinar, but it takes a few lines to get there. Skillcrush is chatty. It wants to seem like a girlfriend, the kind of friend you meet for coffee and spend a few moments catching up with before you get to the point. The details of the webinar aren’t introduced until a few paragraphs into the overall description, which is different from most webinar invitations. 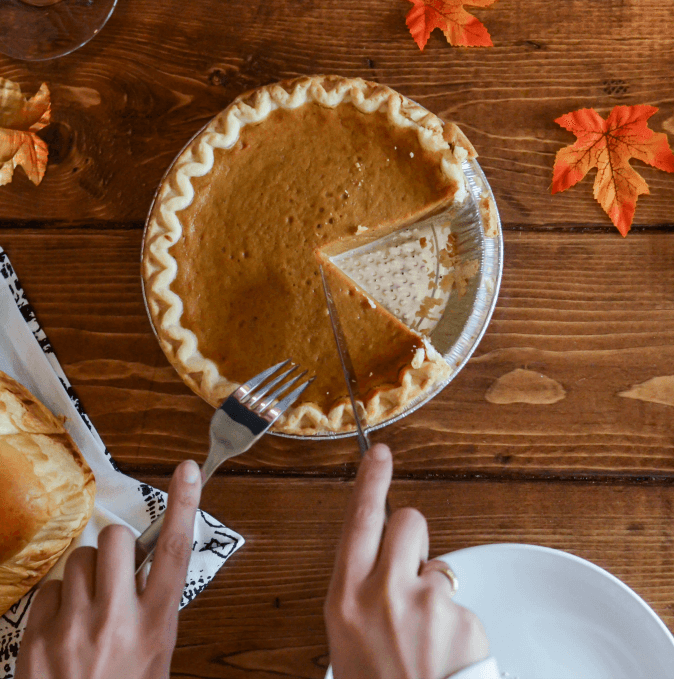 Of course, the email invitation copy is more promotional than a typical chat with a friend would be, but the message still appeals to a reader’s emotions. The length of the description highlights the importance of making sure the text of the email is easy to read. Skillcrush does this by using short paragraphs to break up the long text, making it easy to scan. 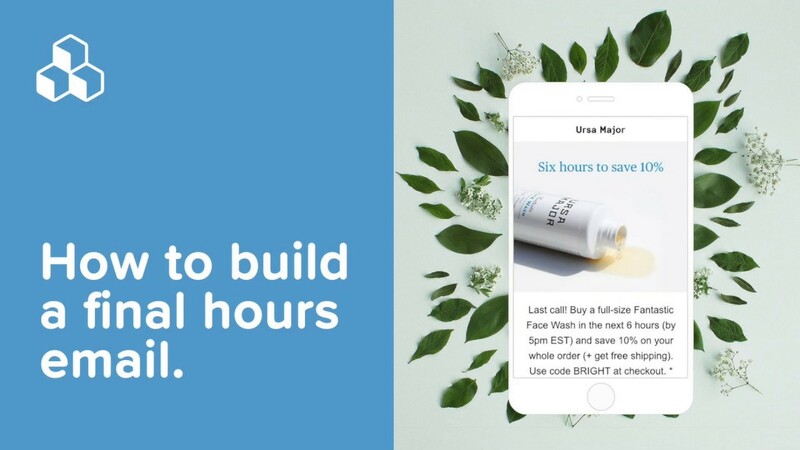 It uses bold text sparingly, only for the most important points of the description, the main message (“get paid while you learn”) and the date and time. Take a look to see how Skillcrush breaks up the text to make its long description more readable. When it does get to the meat of the webinar contents, the items you can learn are displayed in a bulleted list. Bulleted lists are a great way to call out the key selling points in your message. The most important thing a reader can take away from a webinar invitation email? Knowledge of when it is! Skillcrush highlights the event date with a large calendar icon so subscribers can’t miss the date. The time of the event, in two time zones, appears right next to this date icon. Readers will easily know exactly when this webinar is taking place. The date/time info is in front of a slightly darker background color to make it stand out even more. However, there are two noticeable issues with this calendar highlight section. It’s the only criticism we have! Register now! i.e. our main CTA that prompts subscribers to register for the webinar, once again. Just like in this example, there are a few reasons why an image isn’t shown on mobile. One reason is that the email download size has reached its limit on your smartphone. The heading image at the top may have been too heavy to download and there was no more space to download and render the calendar icon. Another reason for this can be that default images are turned off in your inbox. Your webinar won’t be a success if people don’t sign up to attend. So your call-to-action button is one of the most important pieces of your webinar invitation email. Skillcrush isn’t afraid to try a unique call-to-action button. 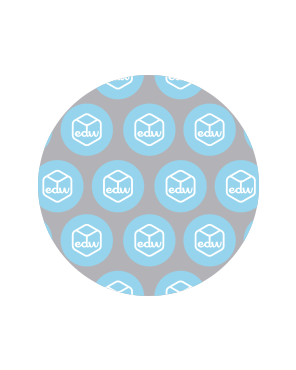 Do you recall the “typical” webinar invitation button we discussed above? It’s what we like to call “webinar blue,” and frankly, it’s a bit overused. Skillcrush wants nothing to do with this shade. It puts its call-to-action in pink (#F16059 in hexidecimal format), the same feminine color that its brand is known for. The call-to-action really stands out, both because of its placement at the bottom of the email, and because of the unique color. This is not your everyday call-to-action button. One of the most important design tactics for the CTA button is that it’s a bulletproof button: i.e. the button is written in HTML (and is not an image) so that it fully renders on all inboxes. Unlike the calendar icon image (from tip #3) that we couldn’t see, this CTA button will always be shown, no matter what! 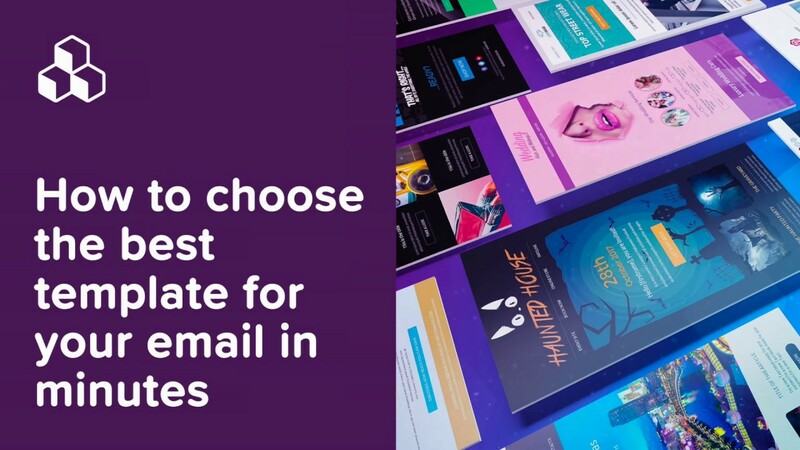 Try a unique header that will grab your readers’ attention and set your invitation apart from the many other webinar invites they are likely to get each week. It’s important to know your audience and design a header that’s right for them. Offer plenty of details about the webinar’s contents. If they’re going to invest the time, your potential webinar attendees want to know exactly what they’re going to get out of it. Give them the details of what you will cover, and what impact it can have on them. Use short paragraphs and bullets to make your text description readable. A detailed description will only entice your readers if you make sure they’re able to read it easily. Break up long text into shorter paragraphs to make your description scannable, then give readers bit-sized nuggets in bullets to highlight the key contents. Make the date and time of your webinar prominent. The time and date of your event are the most important information in your email. Make sure it’s easy to see when the webinar is taking place. Experiment with colors and size of your call-to-action button. Skillcrush succeeds with a bulletproof call-to-action button that renders across all inboxes. Your CTA text should be prominent and enticing. We hope you found our design tips useful! 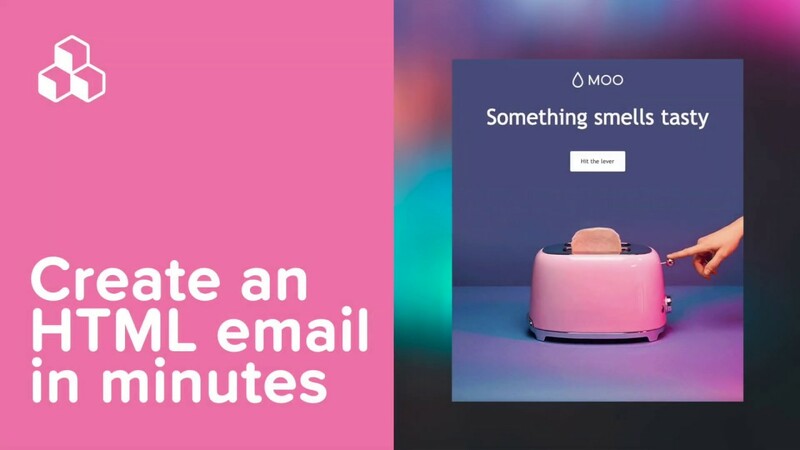 If you’re looking for a hands-on tutorial on how to build a webinar invitation email and experiment with different call-to-action buttons, check out our workshop on How to design bulletproof CTA buttons in email. 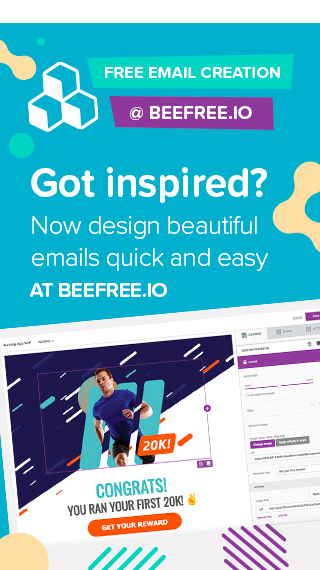 If you’re not already using our BEE editor, sign-up for a BEE Pro free trial and have access to additional templates and design features.